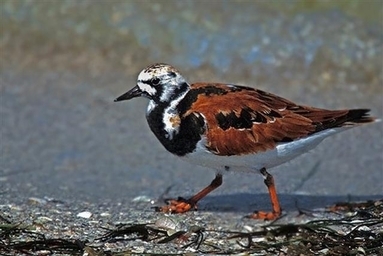 In breeding plumage, the correct name, Ruddy Turnstone is apt. These delightful shore birds have been reported in every month of the year on Arran, turning, not only, stones with their bill in their characteristic way, but seaweed and other items on the shore in the search of insects and other invertebrates. These birds breed on the tundra all round the Arctic, usually starting to breed in their second year. They winter on the coasts of western Europe, Africa, southern Asia, Australasia including New Zealand, the west coast of North and South America, the Gulf of Mexico and can be seen on almost any coast in the world especially intertidal rocky shores. On Arran Turnstones are passage migrants and winter visitors. Most of the Turnstones wintering in the UK breed in northeast Canada and northern Greenland. The first wintering birds arrive in July and the main influx lasts from late August to early October. Studies in Scotland have shown that individual birds are remarkably faithful to their wintering area, within and between winters, returning to the same shore year after year with around 86% of adults surviving from one winter to the next. A study in Australia tracked four birds for a year. In six days they flew from Victoria to Taiwan a distance of 4,700 miles, then on to northern Siberia, where they nested and reared young in six weeks, before heading through the Pacific back to Victoria, a total distance of 16,800 miles. As many of these birds live around twenty years there lifetime travel is huge.